Cameroon is endowed with a very rich cultural and ecological diversity. Cameroon’s forest covers approximately 21 million hectares which is almost half of its territory. Unfortunately Cameroon’s forest is subject to serious problems such as deforestation resulted from logging and farming, a lack of an effective forest management program and awareness, climate change and an increase in population. As a result, the ecosystem has been degraded dramatically and this can reach irreversible proportions. Half of the forest cover has already been lost in 50 years. If we don’t work hand in hand for the conservation and preservation of the flora and fauna in Cameroon it can lead to severe land degradation problems. It is important to join forces to tackle this major problem. Green Cameroon wants to engage you in our program to work together with the locals in Cameroon to improve forest management and community development. Together we can ensure sustainable development and a better future. You can make a difference by getting involved in our ‘Adopt a Tree Program’. This will help maintain the forest and benefit natural resources and animal species. It also helps local community members to improve their lives and at the same time making scarce resources available for posterity. Cameroon, with its gigantic forest ecosystem of flora and fauna, is a developing country in Central Africa between Nigeria and Equatorial Guinea. Once it had one of strongest economies in Central Africa because of its oil resources and favorable agriculture conditions. Unfortunately since decades it is facing a string of problems that affect the environment and the country’s development.In the late 1980’s the economic crisis pushed the country towards heavy logging and governmental corruption. Cameroon failed to implement effective forest conservation programs and now lacks effective protected areas. This resulted in extensive logging by foreign countries, fuel wood collection and extensive farming has caused deforestation on Mount Cameroon. This problem will maintain because of the constant increase in population and the huge demand for wood. Currently hunting of native fauna and flora, habitat loss and climate change are the principal threats to the Mount Cameroon region. 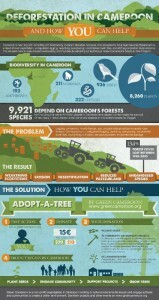 On the eastern side of Mount Cameroon it has been estimated that almost 50% of the forest cover has already been lost. We, from Green Cameroon, think that loss of forest cover goes along with loss of biodiversity which in the long run can lead to severe land degradation problems. Sustainable forest management is needed to prevent irreversible problems to the environment and communities. Therefore we want to increase the ability of local populations to benefit and contribute to natural resource management and conservation. 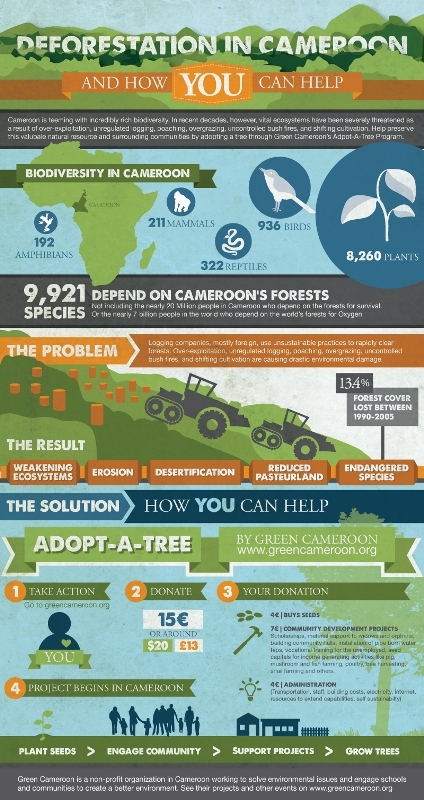 Green Cameroon started the ‘Adopt a Tree Program’ to fight deforestation and helping the local community to improve their lives. Without your help and support we can’t do it. You, as a contributor to this program, can make the difference by adopting a tree for €15,-. By adopting a tree you enable the community to plant a tree and manage the forest. Green Cameroon will provide environmental education about forest management and sustainable farming to The BIG deal: As a school, universityor company it is possible to adopt a whole forest! Can you adopt 1000 trees in one year? The trees will be planted on a beautiful piece of Mount Cameroon and the forest will be named after your school, university or company. Green Cameroon will make a website to show many trees are planted and how close you are to the targeted number.the communities who will preserve the trees. In this way the local community will learn how to make a living by tree planting. Under the supervision of Green Cameroon they get the responsibility to protect the forest, so it will stay in good condition. The deal: The contributor pays €15, -to Green Cameroon. To manage and in order to run the tree project Green Cameroon will keep €4, – for administration expenses. €12, – will be spent on the trees and on community development programs.The contributor receives an online certificate and a newsletter in order to stay up to date about the status of the forest. By adopting a tree you are helping in three main areas: preventing further deforestation, protecting biodiversity and stimulating community development.Forests are essential natural resources for all life on earth and contribute to a safe climate future, economic development, preservation of biodiversity and human well-being. Our survival depends on trees and we will not achieve sustainability and economic development unless we stop deforestation. Forests provide a wide range of products and regulate essential life cycles that protect the climate. It provides a home to thousands of animals, birds and insects. And it is a valuable resource for sustainable farming, recreation and happiness.We are starting the project with communities of the Mount Cameroon Forest Region. The total population is about 1,800,000 people. Beneficiary groups will be youths, entire communities, women and farmers groups. The communities will be responsible for planting the trees, conserve the forest and protect natural resources. Green Cameroon will have an educational role to promote the exchange of good practices and sustainable forest management. The ability of communities to economically benefit from and contribute to environmental conservation will increase. This helps alleviating poverty and creating a better planet for the future. Since 2003 the non-profit organization Green Cameroon has a strong commitment to fight for environmental protection and conservation in our communities. Green Cameroon helps local community members to live better lives by improving on living standards alongside making scarce resources available for posterity. In the past Green Cameroon worked closely together with communities, schools and companies. 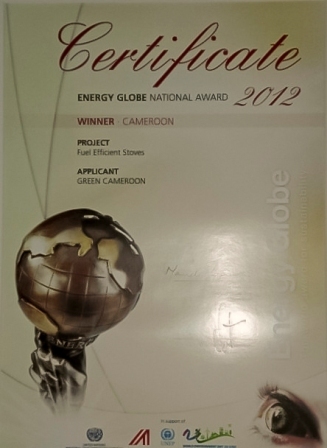 In 2012 Green Cameroon won the National Energy Globe Award for Sustainability. Only with your help,can we really make a change! We are currently working on putting up an automated donation mechanism. For now, you can support the campaigns of Green Cameroon by making a donation by bank transfer to our account: Do not hesitate to contact us if you face any difficulties with this.